Interim boss Michael Press was disappointed his side failed to take advantage of an improved first half showing against Glenavon. Ryan Curran gave the Reds an early lead at Solitude, but they failed to build on it and were pegged back nine minutes after the break by Stephen Murray. Despite having to settle with a point though Press felt there was signs of improvement. “I was disappointed with how we played in the second-half because we didn’t come out for it at all,” he said. “We didn’t keep the ball well enough and we’ve had to rely on our goalkeeper to make some big saves for us and stop us getting beat. “What I said to the players afterwards, though, was that I think that’s exactly the sort of game they’d have lost last week. “We dealt quite well with a lot of Glenavon pressure and I thought our set-up and shape at the back was much better. “There’s still work to be done on that but we’ve only had a couple of nights training and this was the first game, but there were definite improvements in terms of keeping our shape and doing the sort of things that weren’t being done previously. “We started the game well, got ourselves an early goal and created a few more chances that we probably should have stuck away but I was proud of how hard the players worked for one another and the effort they put into the game. “My remit was to take training last week and look after the game against Glenavon. The Reds shaded the first-half and deservedly led at the interval courtesy of Curran’s fifth minute strike, but an equaliser from Murray was the prelude to the visitors’ dominance of the second period at Solitude, where home stopper Richard Brush time and again kept the Lurgan Blues at bay. 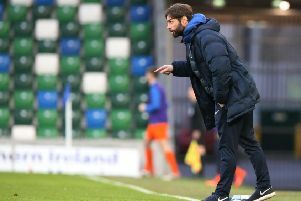 “I think sometimes we’re afraid to miss chances rather than thinking about taking them but that’s a confidence thing that you expect when you’re on the sort of run we’ve been on,” said Glenavon boss Gary Hamilton. “We dominated the start of the game and ended up going 1-0 down out of nothing and you’re sitting there thinking ‘here we go again’ but I was pleased with the response and I told the players at half-time not to lose confidence in themselves. “We had been playing well, doing a lot of the right things and it was just the final shot that wasn’t coming together for us, so I needed them to believe in themselves and believe that it would come. “We got the equaliser quite early and I thought there was only one team in it from there on. “Tuffers hasn’t touched the ball in the second-half and Cliftonville’s keeper has made all sorts of saves. “If it wasn’t for him, we’re sitting here with three points. “That’s disappointing for us but I’ve told the players to take confidence from the performance and keep doing what they’ve been doing. CLIFTONVILLE: Brush, McGovern, Breen, C Curran, R Curran (Casey, 79 mins), R Donnelly, Catney, Gormley, Lavery (Garrett, 64 mins), A Donnelly, Gorman. Unused subs: Neeson, Harney, McConnell, Maguire, McMenamin. GLENAVON: Tuffey, Marron, Daniels, Marshall, Hall, Harmon, McCloskey (Jenkins, 89 mins), Murray, Singleton, Garrett, Sharkey (Larmour, 51 mins). Unused subs: King, Grace, Donnelly, O’Mahony, Norton.